A beautiful 20+ Goffins Cockatoo. He has had a sad journey with heartbreak and fear. 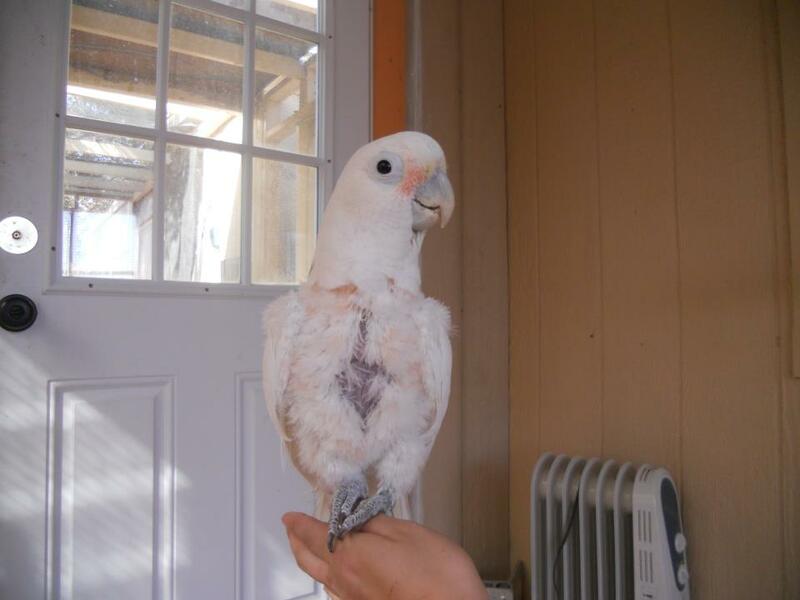 He was used as a breeding bird for years. 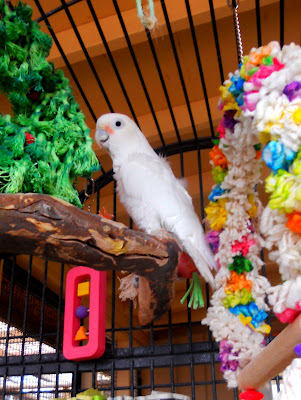 When his owner became ill, she moved all of the birds to a basement. In this prison they were kept and only fed once a week by a hired person. He lived in that basement for several years, surviving on what little seed and water that was supplied. One week he and his mate spilled their water, sadly Houdini’s mate didn’t survive. 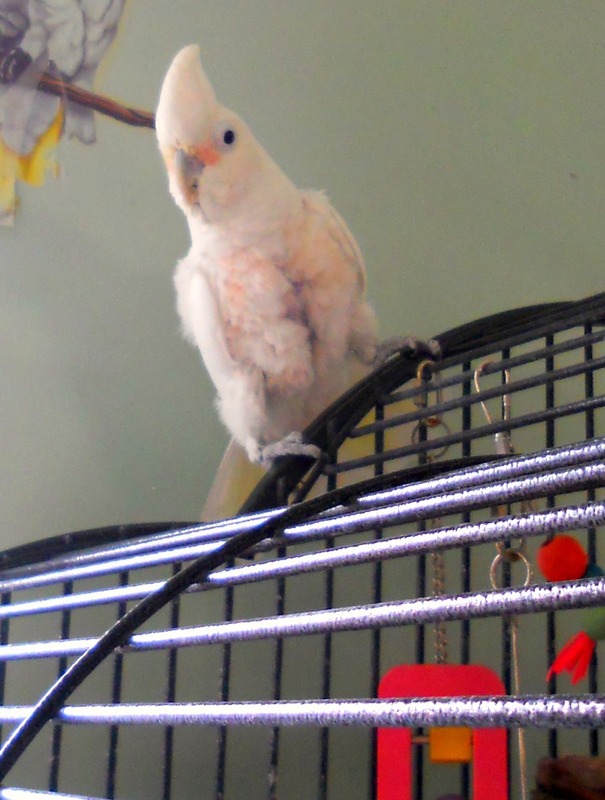 However like his name suggests, Houdini managed to escape his cage, and broke into another cage to get water. 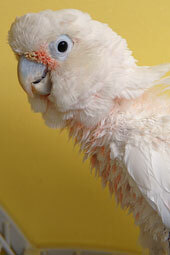 Houdini was finally surrendered to Best Friends Parrot Garden in 2009. His traumatic life has not left him with much trust in humans. He would literally freeze in terror when anyone would come close to his cage. For the first two years with Parrot Gardens, he would not interact with anyone. The folks at Parrot Gardens never gave up though. They constantly tried different people to work with him. A new intern Kaila, volunteered to begin working with Houdini. She began by just sitting and reading to him, speaking softly so he would get use to her voice. She sang to him and played music for him. Each new step was made with considerable patience and love. Everything was done at Houdini’s pace and comfort. Finally with all of her loving efforts, Houdini felt comfortable enough to step up for Kaila :). This was a huge accomplishment for a little Angel that was so terrified of humans. If you need any help getting in touch with Parrot Gardens, I am more than happy to help! Are you that Special Someone? Thank you Deborah! You captured his story exactly!